They say carpet cleaning is a billion-dollar business. That’s billion. Try to imagine how many offices and residence that have carpet. Some even have carpet on the wall. It is a very large market, but also very competitive. It also takes a fair amount of equipment and money to start, but is easier than most business start ups. It really comes down to marketing resources. The Internet is an awesome tool to market your carpet cleaning business. It is far more effective than traditional marketing IF you make sure to take the steps to optimize your website for LOCAL search engine ranking. Developing a website takes care and constant attention. It can cost you up front but it will pay you huge dividends over time. The keys to success in this competitive business include hard work, rendering quality service, and creative marketing strategies that deliver results. Identifying a specific niche in carpet cleaning such as office carpet cleaning or home carpet cleaning. Since carpet cleaning is broken down into two distinct consumer groups - office and home markets. Focus every marketing strategy to your identified niche, do not target both on the same website page. Create fresh and creative copy that appeals to your customers wants and needs. You can even extend your marketing grace to the offline world. You can always purchase ad space at a local newspaper, but this lacks originality and often your ad listing gets lost in the shuffle. The most effective real world tactic is direct door to door marketing - plain and simple - no one wants to do it, but it gets results and fast and on the cheap. Flyering is a time tested marketing approach. Recipients can give it to their families, friends and even neighbors. Flyers can travel far and wide from people to people - you would be surprised how far they go and long they stick around. You will never go wrong with flyering door to door and on bulletin boards. Just make sure you won’t be littering paper around the community like spam on the Internet! You should also plan to run a page on your area’s telephone directory. This method is not nearly as effective as people assume and it is VERY expensive. Before the Internet this was a must, but online searches has subsumed much of the traffic. But it can be a useful tool in your advertising arsenal. After a cleaning job is done you can ask a client to write down on a piece of paper names and contact information of people they can refer to you who would possibly be interested in your carpet cleaning service. Along with those referrals you can offer the client a discount or a free room cleaning for the referral he/ she gave. 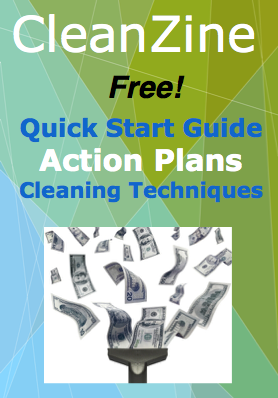 This is a powerful tactic to grow your cleaning business. The future of your business doesn’t lie on how good your marketing strategy is. You can have the best strategy in the world but fail. Reason? ---- poor quality service! Your competency to execute the task on time with quality determine the progress of your business. Carpet cleaning is the type of business and a job that will bring you to your client’s place. You must look professional and handle yourself in the presence of your customers. This will have a great impact on building their trust and getting future business. Be clean and look decent in a business manner at all times. You can purchase a uniform for your cleaners to look neat, presentable and established. A carpet cleaning business of your own is one of the most non- complicated businesses to start. The start-up cost are well within your reach while the profits are outstanding. Always bear in mind to have a wonderful quality service that your clients will always remember and therefor refer you to other prospective clients!